This page summarizes the new features added in ConVirt Enterprise 3.2 release. For learning about ConVirt Cloud features, please refer to ConVirt Enterprise Cloud documentation. This release adds support for managing multiple VMware vSphere/ESX/ESXi hypervisors from within ConVirt. 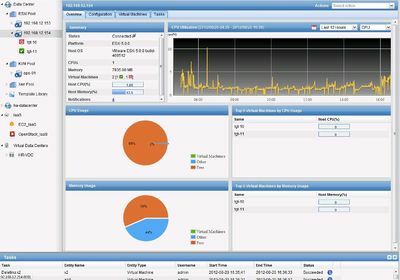 It supports ISO based templates for rapid provisioning, VM Lifecycle management and connecting to VM Console. It also provides managing day to day operations of an existing vCenter deployment from within ConVirt. This brings unified management for VMware, Xen and KVM virtualization platforms as well as Amazon EC2, Openstack cloud platforms from a single console. ESXi/vSphere server with any paid license is required. vCenter deployment is not required. At the time of writing VMware vSphere Essentials kit seems to be the cheapest, see [VMware Pricing]. To add a new host, use the "Add Server" option from a server pool. It is recommended to create a homogeneous pool of servers within a server pool. 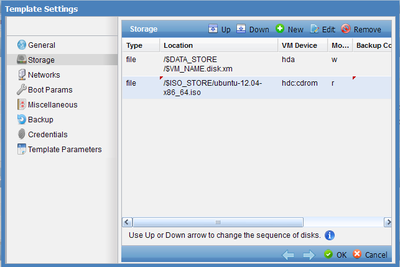 Select ESXi from the dropdown menu. This will work for ESX as well. You will be prompted for providing host details. Pressing ok, will add the server to the navigator. Next, all virtual machines on that hosts would be discovered by ConVirt. Check out the configuration page to learn more about the hypervisor host. ConVirt ships a ISO based install template as a starting point. This template needs to be customized with few information specific to your environment. These are as follows and can be specified in the Template Parameters tab. ISO_STORE : Location where the ISOs are stored. GUEST_ID : Guest id for the virtual machines we are provisioning. Once the template is customized for your environment, you can provision multiple machines with similar characteristics from the template. To Provision a virtual machine, select a template, select the hypervisor host (Server), provide the name and press ok. This will submit a task to provision a new virtual machines. Shortly your virtual machine will be ready to use. Once virtual machine is created or imported, you can do common lifecycle operations on it. This includes, Start, Stop, Kill, Delete and View Console. To view the console, the vmware-vmrc should be installed on the client machine (where browser is running ). Typically this is installed along with the vSphere thick client on the windows machine. You will find it in the browser plugin area. Please make sure that it is in PATH. To validate, open a command prompt and type vmware-vmrc. It should bring up a dialog box with some error message. 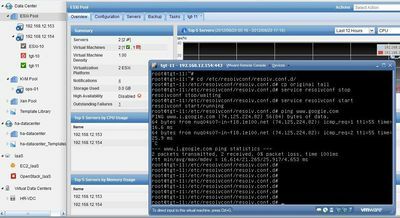 For setting vmware-vmrc on linux, this post provides as a good reference. Once this is setup, you can use the View Console menu item after selecting the Virtual machine to get to its console. With this version, an existing vCenter deployment can also be discovered from ConVirt. To discover a vCenter deployment and manage it from within ConVirt, you need to declare it to ConVirt. Use the vCenter menu from the top tool bar, and add a new vCenter. Provide details and test the connection. Press save to add the vCenter to ConVirt. 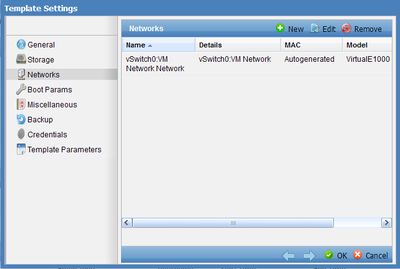 Now to discover entities, select the vCenter and click Import. This will show vCenter like navigator. 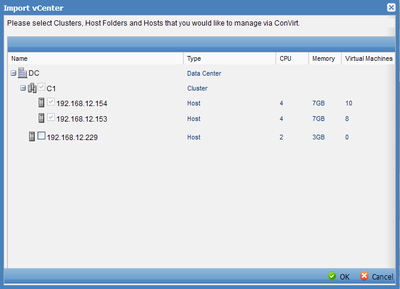 Select the Host Folders, Clusters or individual hosts to be managed within ConVirt. Once this is done, you will see these entities being added to Navigator. All templates will be discovered and added to the navigator as well. Once it is done, day to day operations can be done from within ConVirt. Here is summary of all operations that can be done from within ConVirt. Virtual Machine Operations : Start, Stop, Kill, Delete, Connect to Console. vCenter Template Operations : Import templates from vCenter, Convert virtual machine to Template, Provision from a new virtual machine from vCenter Template. vMotion : Migrate virtual machine from one host to another. Maintenance mode : Put the server in maintenance mode and out of maintenance mode.